Well, we have reached the FINAL day of our 12 Moda Days of Christmas! We hope you have gotten some stocking stuffing inspiration and had a little fun along the way. to pick up some of your favorite things for your friends stockings. We wish you all a Very Merry Christmas & hope Santa is good to you all! What’s not to love about the AccuQuilt Cutting Machines? They just make cutting so simple and effortless. Who wants to spend their valuable time cutting those intricate designs when the Go! Cutter can do it for you in a fraction of the time and with perfect precision. Like this Santa Pillow Case. But aside from the Holidays they have tons of wonderful dies for your everyday projects! We really like this Free Mix & Match Quilt Block Pattern Idea which shows you how to combine quilt blocks to create pieced blocks like those shown or come up with your own! How fun is this Braided Beauty Quilt? So as you can see, the possibilities are endless with the AccuQuilt Go! Cutters. The AccuQuilt Go! & Go! Baby make for the ULTIMATE in Quilty Christmas Gifts! I think santa should leave this for me because I am teaching my 8 year old daughter to quilt and this would be perfect for her so she can cut her own blocks. She would love it! I have been drooling over the AccuQuilt for what feels like forever! This would be the ultimate Christmas gift. I have Parkinson’s Disease and it is getting harder to cut out shapes so this would help immensely. Thank you for the opportunity to win such a fabulous gift! It’s incredible! This would open up a whole new world of how I would quilt! Wonderful giveaway!!!! I would absolutely love for Santa to bring my an AccuQuilt. It would help speed up the process so I can get to piecing and quilting (my favorite part) sooner. Love it! Thanks for the great giveaways! I am really crossing my fingers for this one!! Always wanted one!! Merry Christmas!!! I love making hexie quilts, but I hate cutting out the hexies, this would be great for that! My least favorite part of quilting is cutting, so an AccuQuilt baby would be awesome! Presentão seria para mim,estou economizando para comprar um destes,se ganhar posso comprar um pouco de tecido. I’m dreaming of an Go!Baby to make my quilting days merry and bright. Putting two sons through college means that is all I have been able to do- dream. I would love to find this in my stocking as I would love to make beautiful projects like the ones pictured! I am very slow at cutting, so having something to speed me up would be amazing! I would love Santa to bring me a Go Baby so that my girlfriends and I could revolutionise our sewing days! Piecing, applique, binding.. with the cutting done in an instant we’ll have more time to eat, drink and finish those projects! I would love to find this under my tree. I hate cutting and the Go Baby is such a great size since storage in my studio is always an issue. Thanks for the opportunity to win! This looks like so much fun!!! After all….my sewing room isn’t overflowing all over the house. Really! I’ve just started doing appliques, so I think Santa knows I could use this to be even more creative. This is a great giveaway! Well I have been really good this year! also as I get older I seem to be getting some arthritis in my hands so a Go! would be a great help! Santa, I would love this in my stocking to let my class/bee ladies enjoy – they have all been so good this year. Oh, I love to win this and give it to my daughter for Christmas. She would be over the top excited. She’s a busy mom raising three children so I know the Go Baby would make her quilting life much easier and simpler. Oh, I’d love a Baby GO! So cute and so handy! I would really, really like to find the Go Baby under my Christmas tree this year. It would help so much with that pesky thing known as “accuracy”. Thanks! I would love to win this to expand my quilting skills. I have long wanted to learn applique, but I must admit to being nervous about cutting all those oddly shaped pieces…this would go a long ways to improving my confidence! 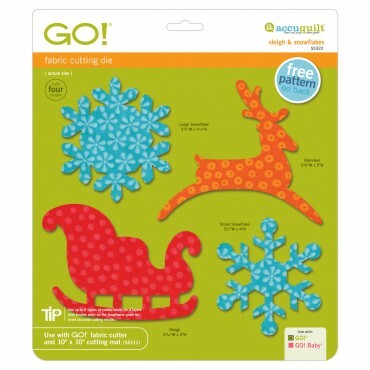 I would love to win a baby go cutter because it would save me lots of time in cutting. It would enable me to getting more quilting done. Santa knows I am not the best at cutting and I end up having not so great triangles, hexies, etc. What a thrill to have this under my tree on Christmas morning! I would love to win the Go Baby! My son passed away a couple of months ago and to help keep me occupied I have been rearranging my fabric. I have alot more than I realized. Something to help cut it with would sure be a blessing! I am about to have another baby so this Baby would help me to continue quilting by saving a lot of time! Please leave this in my stocking! Thanks for the chance to win! Oh baby I’d love a Go Baby! Now that we are just finishing up my new Craft room in the basement, I would love to get into making bigger quilts and this would be perfect! I’ve made a few basic square design quilts but this would be help! I would love to have accurately cut pieces, especially for applique. I have drooled over these cutters for ages! I didn’t expect to get one this year but winning one would be a wonderful Christmas surprise! My holidays would be MADE this year if I won a Go! cutter. Cutting fabric is the slowest and least fun part of sewing and quilting. A die cutter would bring me so much happiness in the coming year! I really need Santa to bring me this Go! cutter! I have VERY limited time for sewing/quilting and this would make the process so much faster! I’d love a chance to win. I’ve recently decided I really need one of these!! Merry Christmas! Well, I have been itching to try one of these. Also enough hand, wrist pain to make serious cutting a challenge. I really hope Santa leaves this for both me and my 12 year old daughter! I just bought her a sewing machine for Christmas and this would be wonderful to have for her and I to use together and start on some really cool projects! These looks like such awesome machines. Thanks for the chance. I’ve been a very good girl this year and Santa needs to bring one of these! I would love for santa to leave me the Go cutter because, after years of quilting, I am noticing that my hands really are sore and stiff after using a rotary cutter. The last thing I am going to do is slow down with my quilting so a Go Cutter is definitely in my future! OMSanta, please leave the Go in my stocking that I have hung with care.. of course it is a quilted stocking and it would have gone together much quicker with all of the cutting done with the Go.. but I will be ready for next year…. Oh, wow!! I’d love to have this in my stocking to make applique shapes quicker and easier to cut! Woot!! I follow your blog. This looks like a great tool for quilting! Santa should bring me this because I’m so new to quilting and I need help with everything, especially cutting out all the pieces!! This would be so AMAZING for Santa to bring this to me! I have wanted one of these! Hopefully he knows that I would use this everyday of the new year! 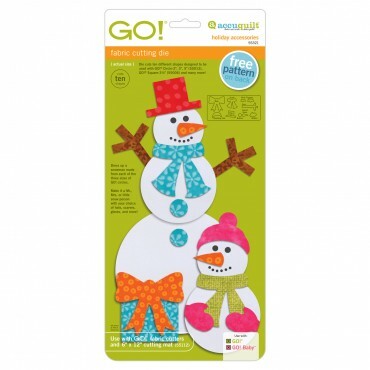 The Go Baby would be just perfect to save time in cutting especially for applique! Who wouldn’t love to find this in their stocking! Wow, I would be the happiest quilter in the WORLD if Santa was to give me the Go Baby. Just think of all the beautiful things I could make! I would love an AccuQuilt Baby for Christmas! Thanks for the chance to win. Oh my! Santa this would be the most awesome thing to find in my stocking. I can’t even dream of buying one, even though I look! I have been very good! I would so like this in my stocking as I have been eying it for so long now. It would make so much easier to cut fabric. I would love to win one from Santa. If he gave me one i think i would give it to Deb C. (# 2 in the comments). I get frustarated with the shakes from low blood sugar drops and can’t even imagine what it would be like to have the shakes from Parkinson’s all the time while trying to sew! Would be so awesome to speed up to cut all those hexagons! I would love to win this and share it with my friends whom I get together to sew with….such a treat. I would love this left in my Christmas stocking because it would so much fun to play with some different shapes without having to cut them myself.. Thanks for the chance. I already follow your blog & I would like one of these to cut hexagons & to make applique projects for my grandkids. I think Santa should leave me an AccuQuilt Go! Baby in my stocking because the design possibilities are endless with all of the dies that are available. I have been looking at purchasing one, but something else has taken away my opportunity (like needing new tires). Thanks for the chance. Oh my… I would be over the moon THRILLED to have this appear at my house! Definitely a major wish list item. Thanks for a fingers & toes crossed chance at one! I am a follower, thanks for another chance. I would love to find this under the tree this year. It would open up wonderful new options for my quilting. Thanks for the chance. This would be amazing! It would speed up cutting so much!!! Santa, if you would only leave an AccuQuilt under my tree this year. The older I get, the harder it is to cut small pieces accurately. It would certainly speed up the process so I can get to piecing and quilting which I love. Thanks for the great giveaways! Wow! Think of how much time this would save me! Oh Santa Baby – I would love a Go Baby! Thanks for the giveaway. Oh! Pick me!! I have a girlfriend who has one and it is so cool!! I would LOVE to have one!! This IS the biggie! Thanks for the opportunity. What a dream it would be to find an AccuQuilt Go Baby under the tree. Perfect for sew many projects in 2013. Thank you for the chance. Oh, please, Santa! Give It to me, I’m a good girl, and you know always I do my best! I have lots of Grand kids to sew for, please Santa! I would love this prize! All the applications I could make for my kids cloths if I had this…. Wow what a wonderful prize. Santa please bring it to me to help me make beautiful quilts like Braided Beauty! Well Santa, I’ve been a pretty good quilter this year. 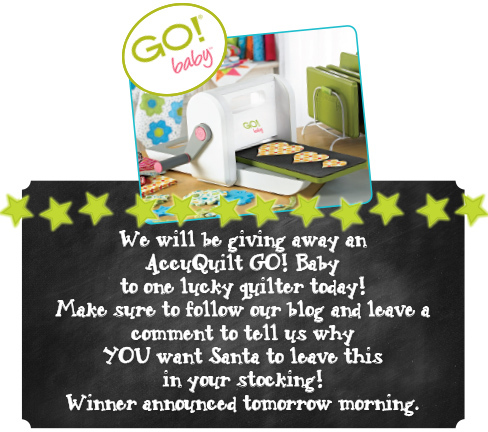 I would love an AccuQuiltGoBaby in my stocking! Please pick me! I would love for Santa to leave this for me because my daughter and I would just have so much fun making things with it! Oh my goodness, this would be a WONDERFUL stocking stuffer. More like a stocking buster. This is not a stocking stuffer but a gift. Of course I would not mind finding it in my stocking this Christmas! Oh my gosh, what a great giveaway! I would love to have one if these! What a wonderful finish to the giveaways. 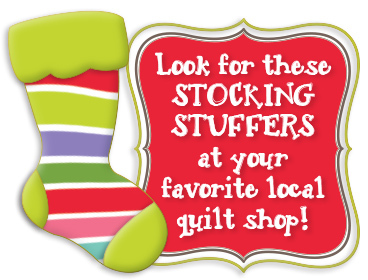 This would be a super stocking stuffer – more like a super gift for more quilting fun! Oh gosh, I’d better get sewing quickly to make a stocking large enough for that awesome gift from Santa. I can really use a Go Baby as it makes it easier and quicker to cut the fabrics. Five hand surgeries in the past two years have not made things better but, sadly, caused new things like dropping stuff and weaker grip. If I got this in my stocking I would..
1. Not ask for anything else. 2. Not have to borrow my friends for all my projects. 3. Be on my best behaviour all year long. 4. Make you a quilt to keep you warm. Why? Well because knowing (a) my excitement for winning this prize and (b) my age I would probably pee just a little if I won this awesome prize!!!!! Sooooooooooooo please oh please pick me!!!! Thanks for sharing such an incredible prize! I think this needs to be in my stocking because I love to make snowflakes! I definitely need to get a bigger stocking so the GO! Baby will fit. Merry Christmas everyone! so I can cut out my quilt pieces more quickly. I think that Santa will check his list and find I have been more “Nice” then “Naughty”! I would love to try out the “Go”. Santa should give me one because I’m a horrid klutz and my fingers and a rotary cutter are a recipe for disaster. This has been so much fun! I need a GO! Baby in my stocking to speed up my cutting! Thanks. Thank you so much all the giveaways but this is the best. Please oh please !!!! for me please. I’d love to win this! I’m a fulltime working mom that loves to quilt and this would be such a time saver for me! Thanks for the chance to enter! Did you hear me squeal over this one?! I would adore having one of these! I’m kind of new to the fusible, cut out kind of projects and I’m loving them. What a time saver this would be! Thank you so much for the opportunity to win one! My husband quit buying me gifts many years ago but perhaps Santa will leave me this perfect gift. Merry Christmas to all! I would love to learn to do applique and this would make cutting the shapes easier. Oh Santa! Please Santa! (I have that song stuck in my head) Make my Christmas dream come true! A little baby would make my sewing days a dream. Thanks for the fun! I would love to have one of these! Especially so that I can die cut hexagons for English Paper Piecing. Merry Christmas to all and to all a good night! Santa, I would be so grateful for this little baby!!! I have so many ideas to put this sweet gift to work!!! Oh how I would love this, the applique possibilities would be endless! Thanks for all of the wonderful give aways, it has been fun seeing all of the neat quilter treats out there. What a wonderful present this would be! I’ve always wanted an AccuQuilt! Santa, I’ve been very good this year! This is a dream! I’m so excited for the person who is going to win this!!! I’d be blessed to win this machine so that my dear mother-in-law and I could make beautiful quilts together (quilting is our bonding time and therapy of sorts) for others. 🙂 Thank you Moda! Merry Christmas! Lovely present! Wish I could get one this year. I would love an AccuQuilt Go! Baby because i’m teaching myself to quilt and have made a couple of things But the cutting is a problem. I can never seem to get a consistent look. Please Santa– I would really help me make perfect quilts. I’ve been good this year-i promise. This would make quilting so much easier and a lot more fun:) Would love to win one! This would be so nice to win. I’m trying to learn how to applique. Thank you Santa for the 12 days of Christmas and I hope everyone has a very Merry Christmas. Santa knows how I love to do applique hand work, but my scissor shapes are not always accurately cut, and I am so limited in the shapes that do right now. I could make so many more things so easily with this cutter!!! Do I even need to say why I would want any AccuQuilt product? I have been drooling over their products for years but have never been able to get any. Santa I’ve been very good this year…I can’t imagine all the hours of fun that I could have sharing this with the children am teaching to sew! Hours of giggles and creating….. I would love to have this in my stocking! I make Rag Quilt Purses and have been thinking about ways to applique to enhance my projects! This would be just the boost I need! Oh Santa, I have been wanting one of these for a long time! I love to quilt and am making all my family quilts and this would let me get them their quilts so much quicker! I would love for Santa to leave me a Go! as it would save me time and increasing arthritis! I would be able to “crank” out more quilts, and give more to our guild’s charitable causes (QOV and children). Thanks for the chance to win! Wow — I would love a GoBaby for Christmas. Oh what fun could be had, if only I win this one. What fun it was to follow Moda’s 12 days of Christmas. always wanted to do a bargello but cutting those strips is rather daunting – love one of these to do the cutting for me. Santa – please bring me this – I love the ease and accuracy with which it would cut shapes! I am just starting to do applique quilts and this would be wonderful for that. Please Santa make my year! I’d love one of these in my stocking. I would share it with my quilting group and let everyone have a Go! Thanks for the chance to win it. I would love to own this as I love to make quilt and easy quilts and it would save lots of time, plus be more accurate than using scissors and templates. I have been very very good this year! I’d love for Santa to bring me a Go! Baby. It would save me so much time on hexies!!! I’d like Santa to leave this in my stocking because I think I could get into hexies in a big way, but dread all of the tedious cutting out of paper AND fabric involved. How cute are those quilts! Would love to have one of these, I am an appliquer at heart and this would make it easy to create all sorts of things! I would love to win a GoBaby for Christmas. I would love to use the Christmas dies. They look so fun and cheery. Thank you for this great giveaway. I would love to win this Go! Baby. have had a stroke, and using scissors can be difficult at times. Wow, what an amazing giveaway! I would love to have this, as I am a fairly new quilter and it would open up a world of new knowledge and skills! Oh, Santa I have been a good girl! That would be “totally awesome” to win. My grandaughter is ready to make quilt blocks with more than squares. The Go! would cut more complex pieces accruately – making her quilting much easier and more satisfying. Santa, I really need this, have wanted one forever. Why- because Kate-you know my four year old grand daughter has decided that I should make a Baltimore Album Quilt for her, her girl cousin, her boy cousin, and her brother. She is claiming the one done with needle turn and I think the rest will need to be machine applique. Thanks for making Kate’s wish come true! Santa knows I need this in my stocking so that I can Do more cutting faster! After all look what he does in just one night! Accuquilt has been on my list for two yrs now! With this AccuQuilt Go I could maybe master some applique projects. I have arthritus in my hand so I have a hard time cutting shapes. Please Santa leave this for me I have been very good this year. As hard as I try, I am not always successful at accurate cutting. What a wonderful help this would be, then I could spend more time sewing and have all my pieces fit together nicely! I would love to be able to use the GO BABY to cut out the pieces for my next quilt. They have so many different dies for the cutter that I would love to try! I would love for Santa to leave this under my tree. I’ve been looking at the AccuQuilt machine for a while, but they’re a little out of my price range. I could make so many things with this. I’ve got a quilting buddy who would just love to get this in her stocking. I already have one. What a difference from the days when every piece was cut by hand with scissors! This would be great fun! Would love to get this, as I’m fairly new to quilting and accurate cutting is still a developing skill…..
I’m already pretending to be Santa and thinking of all the things that I will create with my Accu-Quilt! Thanks so much for this great chance! I’d love a quick fun way to cut out applique shapes plus it would be a fast way for my mom to be able to cut squares and strips. I would love to have a Go! It would make my quilting life so fun! I plan to churn out some quilts for a new charity I found out about http://www.kidkottage.org over the holidays and the Go! Baby would save me soooo much time! Finding this in my stocking would be a dream come true! My quilting would take on a whole new direction! Sure hope Santa ‘Baby’ has my name on his list to leave this Accuquilt ‘GO! Baby’ under my tree….what fun it would be to share with my crafty friends! Thanks for the sweet giveaway! Since having a grandbaby….I can just imagine all sorts of things that I could do with this!! Oh Oh, I would so love to win this Baby! My granddaughter would have her own machine and would not have to borrow my GO! I love it so much! I think this should be in my stocking because I am not good at cutting shapes. This would expand my quilting and appliqué talents immensely. Please pick me! I will be good for ever and it will fit in my stocking ,i wanted it for years but it is not availible here in Belgium. Thanks for the chance. I would be like a quilting queen with this in my sewing room…Santa I never, ever win anything please pick me!!!! This would save me so much time with all my applique projects. What a wonderful gift this would be. Oh WOW! This would be the most ultimate Christmas present EVER! Thank you for the chance to win it! I love making hexies, and this would make the process so much faster! I would also do more applique, I hate cutting out all those pieces! Just think – he could cut and I could sew – it’s a nice little dream, right? All I want for Christmas is an Accuquilt Go Baby! P.S. I promise I’ve been very good and cleaned up all of those messy scraps in my craft room. Having the Go Baby just might help me get those unfinished projects done so I have more time to be naughty…I mean, nice. I would LOVE to have this! With two small boys in tow, anything that can speed up my projects would come in handy. I would love Santa to leave this in my stocking. I am a new quilter and would love help getting the pieces I cut to be more accurate. Also, my 14-year-old daughter is showing an interest in quilting, and she would LOVE this tool! Thanks Santa! Thanks for a fun give away! Let me stay thank you ahead of time Santa !! Oh my goodness…I can’t possibly imagine winning this!!! Thanks for the chance to win these wonderful gifts! I would love to find one under the tree because it would be so awesome to get something so cool under the tree! Cutting fabric is my least favorite part of the quilting process, so I would love to win this wonderful tool. Thanks for the chance. Dear Santa, If you pick me I would just GO GO crazy with happiness – best Christmas gift ever!! OMG, Santa please pick me! pick me! I need this because it will make me very very happy! This in my stocking would be too good to be true! I have found that I adore appliqué quilting, and the AccuQuilt Go! Baby would step up my game with precise, accurate designs! I would love Santa to bring me an Accuquilt. Appliqué is my favorite look but my cutting skills are below par for intricate shapes. Santa I could use the help. Ohhhh I would love for Santa to leave this in my stocking! Cutting out wedding ring quilt pieces would be so much easier!Baby quilts with applique! The possibilites are endless! Because I’ve been awlfully good ths year? Because I have stiff fingers? Oh, please, just cause I’d like to have it? I believe Santa should send this my way because it has been on my wish list ever since I returned to quilting. Since my 62nd birthday is only a week & 1/2 after Christmas, it would cover both presents(for several years at least) and make my arthritic hands so much happier. i would love to win! i could work through some scraps and my kids could help! pretty please with a quilt on top*!! I have had a really rough week and I think Santa knows I have been good this year and deserve something positive to happen. How did Moda know this was on my list this year? So excited for the chance… thank you! Oh what a fantastic gift, I could make lots of lovely things with it and make many more people happy like I will be if I get it! Santa – this is the first item on my Christmas list!!! Please, please – I promise to use it every day and I’ll put it somewhere safe and I’ll take such good care of it!! I am so terrible at cutting fabric that my poor husband does it for me…we would both love it if I won this incredible giveaway! I could applique ,,,, everything! Improved accuracy and ease of cutting would be a big plus. Oh…..Santa baby! I can see myself cutting with this right now!!! What cute things Mrs. Clause could make! I would really love to win this Go Baby because I could make some really cute things for my babies and even let them help!!! I’d love Father Christmas to leave this under my tree because my mam would like to try quilting but really, really struggles with using a rotary cutter – this would be perfect! I want Santa to leave this Go Baby with me because I’ve been good all year. Santa would make my year with this gift. Merry Christmas to all. Santa, I’ve tried to be extra good this year. I’d love a cute little GO! Baby. I’d promise to take good care of it, feed it beautiful fabric and create beautiful things with it. As I have a little sewing room the baby is the perfect size for me to leave out on my cutting table all the time, plus take with me to sew-cials. I’ve been a good girl, Santa!!! a perfect prize! so nice to have another chance at winning a go!baby! thanx amil for the chance. Dear Santa, I have been VERY good this year and with 3 beautiful children under 4 they do not leave me a lot of time to cut out, I would love a little GO baby to help me create beautiful quilts for my friends and family. My oh my, think of all the fun things I can make for the grand babies!! Would really love to win this one!! I’d like to give it to my 82 year old mother in law as a gift. She introduced me to quilting and has been my biggest supporter. She has not been quilting as much lately because she is finding it difficult to use the cutter and scissors. Oooh, please pick me!!! I want one of these to cut out letters for applique! Oh, the things I create create if Santa brought me my very own Go!Baby. The possibilities are endless. Please Santa, I have been extra good this year! I NEED this! PLease Santa I really really want an Accuquilt GO! Baby!! Oh Santa, you got my letter. You know this is on my list. thanks for this opportunity to win this. Santa ROCKS!!! Just a perfect way to end the 12 Days of giveaways. Love to win. I hope Santa leaves a Go Baby under my tree this Christmas. It would make my cutting pieces more precise,which I desperately need help with. I would be able to get more projects completed and build my quilting confidence. Thanks! Thank you Thank you for doing this. There are so many uses that I would really love to have GO!Baby!. Please, Santa, I’ve been good all year long and I’m having an eye on this little baby for so long! Pick me, please. i am sitting here looking at this beautiful tool. last week i fell and broke my right wrist. of course i am a long way from knowing if i’ll be able cut fabric with a rotary again. but this would be such a huge blessing for me to continue with the hobby i love. it would be a dream come true. Oh my! This would be wonderful to have! What a great prize for the last day. This would be SEWWWW much fun! PIck me PIck me! Please! Dear Santa, I’ve been very good this month so far! Well, I can’t say the whole year! Many Blessings to everyone! Wow I have wanted one of these babies forever! I would love for Santa to leave an AccuQuilt GO! Baby in my stocking because I love to sew and this would make things go so much faster! Oh please Oh please dear Santa aka random number generator pick me, I’ve been a really good girl this year. This will make life so much easier for me! Quilting will be a breeze, too! This is an awesome give away! Dear Santa, I NEED this because it would make cutting much easier on my wrists. I’ve been wanting a Go! Baby for years! Drop it off at my house Santa, please! Dear Santa this has been on my list for ever. This would be a great help to me in my quilting. The AccuQuilt Go and Go Baby are two of the greatest cutters since the rotary cutter. I could do so much more with it. I not only want one but need one! Please Santa please! This would give me more time sewing and less time cutting! There is no way I can afford one of these, so I’ll only get it if Santa decides I’m worthy. I’ve been working hard Santa, I’m about to clean the oven which definitely counts for something! I have been wanting one these babies for YEARS!!! Come on Santa, make my wish come true this year! Accuquilts are amazing! I have seen them in action and just adore them. I would love this so I could make some fancier quilts faster! oooooooh, I have been wanting a Go! Baby for so long. I am sure that Santa knows this is at the top of my wish list! My friends rave about how easily they cut out shapes with their Go’s, and your samples are so adorable! I would love to win this to create adorable quilts and gifts. Merry Christmas everyone! What generous Santas you are this year! I am so happy to see more and more people taking interest in sewing and quilting! I sure hope Santa leaves this goodie in my stocking because I am a 911 Dispatcher and I quilt and sew to remove the worries of the day! This would enable me to have more time to create some beautiful items to donate to emergency service organizations! Merry Christmas to Moda and all your employees! What a wonderful gift for the last days of the 12 days giveaways. I heard their products is save time and easy to use. I would love to win. I sew want one of these Santa and would use it alot! Love Applique and this would make it so much easier 🙂 Thank You and Happy Holidays!!! Come on, Santa! You know I have plenty of use for this beauty! Santa – I don’t know what else to say but I want it! Who wouldn’t love to wake up to this one Christmas Day?! Thanks guys! Talk about leaving the best to last!! I hope Santa’s listening, because I would really, really like to see the GO! Baby under my tree. Thanks for a great 12 days of giveaways. What a wonderful giveaway. Thank you. I heard so many great things about the AccuQuilt but I just can’t afford one. It looks creative. This would be awesome, all I can think of is the time I can save which also means no more sore back from leaning over the table cutting. I’d LOVE a Go! Baby! Most of my cutting would work in the Baby and I love how portable it is and how easy it is to use. I’m put this little Baby to good use in my studio! I have been drooling over this machine for quite some time now. Winning one would be the frosting on the cake. Thank you for the chance to win one of these fabulous machines. The possibilities would be endless. It’s been such a bad year here, the loss of my sister, my mother being sick and now my dad has an injury that the doctors can’t figure out. We decided not to buy gifts, and only have the fake tree up. It’s a sad Christmas. As a brand new quilter, I would love to receive this in my stocking. I’m finding out these quilting supplies can be tough on an old woman’s budget. Santa needs to leave that for me. cause I would really really use it. thanks. Who wouldn’t want this on their list. thanks for the 12 days of giveaways. I’ve been sewing or quilting for 70 years….this would be the perfect gift for this Grandma! I’ve wanted anything Accuquilt for years. I would be thrilled to win a Go Baby. I’ve been wanting one of these since they first came out. Dear Santa, please drop one off at my house! Oh, this is the greatest. Please Santa, please Santa. I think Santa should be nice to me and leave this lovely gift! My mother in law and my daughter and I would really put this to good use! thank you! I keep posting but it doesn’t show up!! Would love one!! I can only imagine how many more projects I can complete by saving time with the Accuquilt Go! Baby!! Pretty please, Santa? 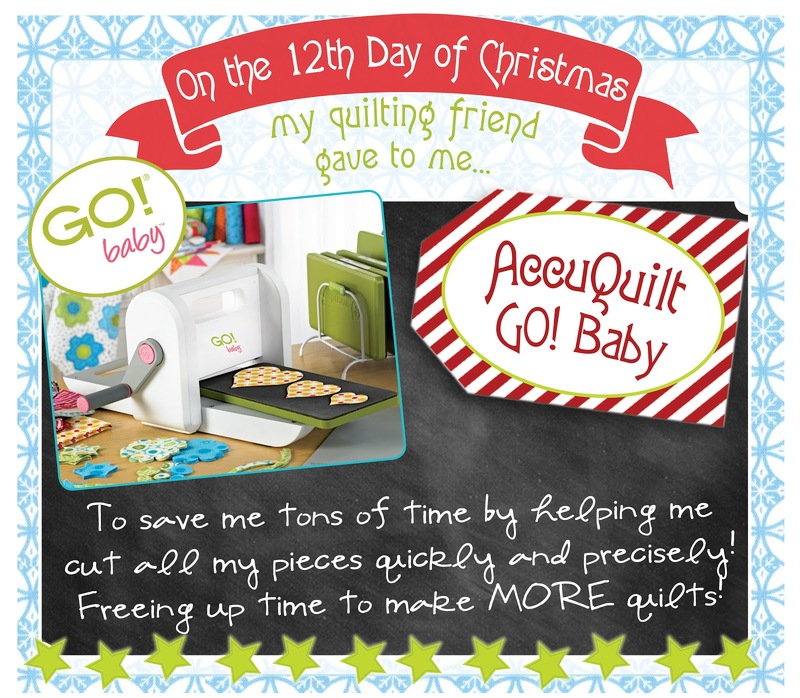 Santa…you know I dream about Accuquilt Go!!! What a wonderful invention. Hope my dreams come true! Oh my goodness Santa, the things I could create with this! Please leave one under my Christmas tree! What a great giveaway! I would love to make a hexie quilt with the Accuquilt! I would love a Go Baby. I can think of so many ways to use it! Wow what a way to end the show! I would love to have a Go! baby so I can get rid of my box of scraps by cutting them quickly in to manageable pieces! I also want to make a hexagon quilt, so this would make the cutting for that so much easier, too! I would love to win one of these. I have borrowed my mother-in-law’s and it was wonderful! Thanks for the chance to win. Wow what a great finish! I have been hoping for a new sewing machine in my stocking! Oh, so I could whip through some Hexies!! Please, Santa, please!!! Santa should put this under my tree because he knows how I’ve longed for this little machine. I hope I win because it would be such a hoot! Merry Christmas! I would love Santa to pick me. I have severe carpal tunnel in both arms and this fabulous gift would relieve some of it. I would get charity quilts and other gifts done a whole lot quicker with a lot less pain. Even with a cutting table, I find my shoulders get very achy cutting out pieces, so having one would definitely improve my throughput. This would make applique SOO much fun! I would be so thrilled to be able to have one of these wonderful machines. Thanks Moda Santa, for 12 Days of fun. It looks like there’s many many projects that can be created with the Accuquilt! Please pick me! thank you for being so generous!! This would definitely go well with my scrap busting for 2013!! Merry Christmas!! My cutting is not the best & I avoid some projects because of the amount of cutting & 100% accuracy required. The thought of having a Go Baby to do the hard work for me is just amazing, I’d be trying all those examples above especially the Braided Beauty Quilt – there’s one I would currently swoon over but avoid. That Santa pillowcase is so cute! I would love to make the curtain too. I would love to have one of these! Such a fun item to end the past 12 days! Thank you for the opportunity! This would be the perfect gift for me! I’ve wanted a Go baby for the past couple of years. Santa can leave this under the tree for me. I really need Santa to leave this in my stocking. I have a really hard time cutting anything in the fall and winter, because of a car accident 12 years ago. This would really help me be able to quilt during these months. Thank you so much for the chance to win. I would love to play with this… Love it!! I want one SEAUX bad! Every time I manage to come up with a little money and think I can maybe put one on layaway, a bill needs paying. This gets old! I hear one calling my name, I just hope it hears me answering! HAHAHA! I would love this, Santa. It would save so much time. Oh what fun to create that darling reindeer pillowcase for my grandchildren should Santa leave this in my stocking…please Santa. Thank you for the great 12 Days of Christmas. It was enjoyable to check the blog wach day to see what Moda Santa was leaving each day. thank you and Merry Christmas! Have always wanted a Accuquilt Go Baby! thank you for the chance to win one! My heart skipped a beat when I saw this. I want a Accuquilt so bad! It would make me very happy to win 🙂 Merry Christmas! This would be a dream come true for me…I am trying to get my handcrafted boutique going while working full time to take care of my two kiddos and our dog! (He is my 3rdLillie child…lol). My daughters want to help so it is a true family business but they are too small to use most of my tools. This would be a blessing for us and allow them to actively participate in our business. I would love to win this because it would help relieve some of the pain in my hands from using my rotary cutter so often. This is so on my list! Santa I just know that you are bringing me one of those. I could really use this right now especially since my embroidery machine won’t work. 🙂 Thanks for a chance to win. I have wanted an AccuQuilt Go forever! I would love for this in my stocking! I would love this! I could use it for so many things! I would put it to good use. I would love to win! I saw a cute butterfly quilt made using their butterfly die…I would love to make it! Dear Santa, I’ve been good most of the time except for when ripping out those seams. I would really really like to find this under my tree so I could spend less time being bad with the seam ripper. This would really save time on cutting out those cool designs by hand. Oh Santa, please let me see this in my stocking. Well again, thanks for the contest and yes, Santa I need this because the possibilities are endless. I would love to find a Go Baby in my stocking!!! I would like to make quilts for my family and the Go! Baby would be a tremendous help. Santa has been good to me all year round. I would love more time to spend with hubby! Dear (Moda) Santa, I really NEED this Accuquilt GO Baby. I am an obsessed quilter and want to expand my abilities to include applique and all of the wonderful things I could accomplish with this Go Baby. Thank you and I hope I win. This would really help me with my inaccurate cutting…arthritis really makes the cutting out of my quilts difficult! Please, Santa, I’d love to find this under the tree for me this year! I would love to have a Go Baby. It has been on my Christmas list for a long time. I close my eyes and just dream about it. I have been wishing for a GO! cutter for a long time, and I have been amazingly nice this year! I would love to win this Baby Go because it would make this holidays unforgettable! Terrific giveaway, thanks for the chance to win! I love quilting but my failing eyesight makes it hard to cut an exact pattern… the Accuquilt will make quilting enjoyable again! I love to applique but never find the time to try more intricate patterns. I am also very fussy so having accurate cuts and unlimited options for designing would be awesome. I then might be able to steal away some quilting time for myself!! Wow, I’ll have to put up my BIG stocking if I’m lucky enough to win this one! A GO Baby would make applique soooo mush easier. Thanks for the chance and Merry Christmas. Wow I sure could use an Accucut with my old hands. What a neat give away. I would absolutely LOVE this. I have rheumatoid arthritis and find it difficult to use scissors or rotary cutter.This would make my quilting life sooo much easier and my designing more exciting!! Please??? I think this would be a great asset to my quilting! I really really have been good and have been wanting this forever!! Please bring it to me, Santa! I would love to win a Go! cutter! My mother has to have me cut her fabric due to arthritis & I’d give her the Go! should I win. Pay it forward!!! This would be awesome and looks so fun!! who wouldn’t want to win the accuquilt? i would for sure, i’ve been wanting one since i first saw it. hoping santa will bring it to me! I want an AccuQuilt, and I’ve been a good girl all year! I would love to win. Making my own precuts would be amazing, especially the more tricky ones! Thanks for the chance to win! I hope I’m not too late … I’ve been dreaming to get one of these for two years… Maybe my wish will finally come true!!! Santa please bring me a new Accuquilt Go!Baby for Christmas. I don’t have as much time to sew as I would like and this would help me with my projects. Please Santa, please! !